You’ve heard about the Grand Trine in Water (GTW), of course. 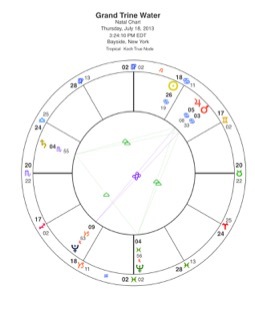 Jupiter in Cancer, Saturn in Scorpio, and Neptune in Pisces form a trine between July 17th and 19th, although it is in orb for some time on either side of those dates. The sun and Mars have or will also step in to activate the trine, so we can see that late June through early August is really trine time. Jupiter in Cancer tends towards the protective. The benevolent leader who knows what’s best is a typical manifestation (here’s an article on Jupiter in Cancer). Saturn in Scorpio is also rather protective. Neither Saturn nor Scorpio (the fixed water sign) is prone to movement, and there is a tendency towards security and even some suspicion with these two symbols mixed. Sure, Saturn will ultimately prune down our economic and sexual collective mindset to the essentials, but that pruning process gets messy. Neptune in his home sign of Pisces can go either way, as long as it goes a long way. Neptune in Pisces is everything from a collective recognition of our oneness with nature and even the Cosmos, when taken on a spiritual level. On a more material plane, it can be obsessive adherence to an ideology that will save us all - think Communism and many other -isms that got started the last time Neptune was at home. Taken together, the GTW does suggest the possibility of letting go on an emotional level. Trines often signify releases, after all. On a collective level, however, this configuration looks very much like an easy relationship among those in power. That becomes especially likely when we consider that the GTW is really a kite. A kite formation occurs with a grand trine has a planet sitting midway between two points. The GTW has that - and the planet sitting in at the base of the kite is Pluto in Capricorn, who is in mutual reception with Saturn (they are in each other’s signs). These two have been working to consolidate power for some time, since last fall when they first came into a sextile with each other. It is most clearly seen in the powers of government, big business, and particularly in finance. It’s true that Pluto in Capricorn is in the business of transforming the power structures of government and business, but Pluto works by intensify existing structures, in order to polarize the opposition and thus create more powerful change. Uranus, square to Pluto, has also been affecting the kite formation, and we can see that in all manner of opposition forming and erupting. Uranus has been standing off to the side, needling the coziness of the kite with impertinent questions and angry responses. With Pluto at the base of the kite, we can see that the news in the past few days has indeed demonstrated a consolidation of power. Both Goldman-Sachs and Bank of American announced strong revenues in the second quarter of the year. These two financial firms were at the center of controversy about banking practices that led to the collapse in 2008 and the subsequent recession. That they are doing well seems to stand in direct opposition to consideration of reinstating the Glass-Steagall Act of 1933 (passed at the closing square of the Uranus-Pluto cycle). Senators McCain and Warren are acting in uncharacteristically Uranian fashion, challenging the harmony of the kite. The ACLU took up the Uranian challenge, issuing a report that details how police departments are collecting and keeping data on the travel habits of millions of Americans, including those not under suspicion for any crime. The Orwellian image of the state having knowledge of your every move via your cell phone was not enough - now we find that we are being tracked in our cars. Once again, the consolidation of power comes to light as Uranus breaks the story. The Edward Snowden story is probably the drama of May's Uranus-Pluto square, and this information is the latest installment of just how much a police state the U.S. has become. All week, we’ve been buzzing with the fallout of the George Zimmerman trial. Although it is harder to see, there seems to be some collusion (on an unconscious level) among those in power, including the not-too-aggressive prosecution and not-too-clear judge. The questions of race that came up during and after the trial seem to obscure (Neptune) deeper issues, such as those of class and the conditions of our cities, where the need for an armed Neighborhood Watch seems reasonable in the first place. Yet Uranus has not been quiet on this one, and a series of protests has erupted throughout the country, with more to come. And finally - not really finally, but for now - the Catholic Church has offered time off in Purgatory for devotees who follow the Pope’s upcoming trip on Twitter. It shows a belief system that reflects a profoundly unspiritual approach to the deeper questions of existence, but which demonstrates in bold GWT colors the awesome control the Powers That Be think they have.